Jeffrey Goldberg’s Atlantic essay, “The Obama Doctrine”, opens with two contrasting conclusions which could be drawn from events on Friday, August 30, 2013. In President Obama’s mind, August 30, 2013, “was his liberation day, the day he defied not only the foreign-policy establishment and its cruise-missile playbook, but also [defied] the demands of America’s frustrating, high-maintenance allies in the Middle East. Barack Obama’s presidential “liberation day” began with a “thundering speech” given on his behalf by Secretary of State John Kerry. “Kerry’s uncharacteristically Churchillian remarks”, were delivered in the State Department’s Treaty Room. It dealt with the gassing of Syrian civilians by the president of Syria, Bashar al-Assad. In his remarks, Kerry said Assad should be punished, in part, because the “credibility and the future interests of the United States of America and our allies” were at stake. The Pentagon and the White House’s national-security team believed President Obama was ready to attack President Assad for “crossing the red line” by gassing civilians. Goldberg reports that “John Kerry told me he was expecting a strike the day after his speech”. Late in the afternoon, President Obama “determined that he was simply not prepared to authorize a strike”. He asked Denis McDonough, his chief of staff, to take a walk with him on the South Lawn of the White House. Obama did not choose McDonough randomly: He is the Obama aide most averse to U.S. military intervention, and someone who, in the words of one of his colleagues, “thinks in terms of traps.” . . .Obama and McDonough shared a long-standing resentment. When the two men came back to the Oval Office, the president told his national-security aides that he planned to stand down. There would be no attack the next day; he wanted to refer the matter to Congress for a vote. Aides in the room were shocked. . .
What led to this decision by the President? A second major factor was the failure of [British Prime Minister] Cameron to obtain the consent of his parliament. The third, and most important, factor, he told me, was “our assessment that while we could inflict some damage on Assad, we could not, through a missile strike, eliminate the chemical weapons themselves, and what I would then face was the prospect of Assad having survived the strike and claiming he had successfully defied the United States, that the United States had acted unlawfully in the absence of a UN mandate, and that that would have potentially strengthened his hand rather than weakened it. Obama’s decision to choose further negotiations over a military strike drew heavy criticism. Today, three years after the U.S. came close to yet another military attack on a Muslim state, John Kerry has come to understand the good judgment behind Obama’s choice. Goldberg described the President’s understanding of how his decision would be read by his critics. He writes, “Obama understands that the decision he made to step back from air strikes, and to allow the violation of a red line he himself had drawn to go unpunished, will be interrogated mercilessly by historians. But today that decision is a source of deep satisfaction for him. “I’m very proud of this moment,” he told me. “The overwhelming weight of conventional wisdom and the machinery of our national-security apparatus had gone fairly far. The perception was that my credibility was at stake, that America’s credibility was at stake. And so for me to press the pause button at that moment, I knew, would cost me politically. This was the moment the President believes he finally broke with what he calls, derisively, the “Washington playbook”. Goldberg quotes Obama’s description of this “playbook”. There’s a playbook in Washington that presidents are supposed to follow. It’s a playbook that comes out of the foreign-policy establishment. And the playbook prescribes responses to different events, and these responses tend to be militarized responses. Where America is directly threatened, the playbook works. But the playbook can also be a trap that can lead to bad decisions. In the midst of an international challenge like Syria, you get judged harshly if you don’t follow the playbook, even if there are good reasons why it does not apply. Obama knows there are times when bellicosity is justified. But choices must be made in our current international arena. Obama believes that the Manicheanism, and eloquently rendered bellicosity, commonly associated with Churchill, were justified by Hitler’s rise, and were at times defensible in the struggle against the Soviet Union. But he also thinks rhetoric should be weaponized sparingly, if at all, in today’s more ambiguous and complicated international arena. The president believes that Churchillian rhetoric and, more to the point, Churchillian habits of thought, helped bring his predecessor, George W. Bush, to ruinous war in Iraq. Obama entered the White House bent on getting out of Iraq and Afghanistan; he was not seeking new dragons to slay. And he was particularly mindful of promising victory in conflicts he believed to be unwinnable. Hillary Clinton, when she was Obama’s secretary of state, argued for an early and assertive response to Assad’s violence. In 2014, after she left office, Clinton told me that “the failure to help build up a credible fighting force of the people who were the originators of the protests against Assad … left a big vacuum, which the jihadists have now filled”. President Obama opposed the 2003 Iraq invasion launched by President George W. Bush. He told Goldberg that invasion “should have taught Democratic interventionists like Clinton, who had voted for its authorization, the dangers of doing stupid [things]”. Hillary Clinton has said she regrets her vote to support President Bush’s decision to attack Iraq. She has, however, continued to maintain her support for interventionism. Less than a year later, after she was no longer Secretary of State, The Week charged that Clinton had stepped up her criticism of Obama’s foreign policy. Clinton distanced herself from President Obama’s foreign policy, suggesting that he has not made it clear how D.C. “intend[s] to lead and manage” international affairs. Clinton advocated a more interventionist approach, arguing that, “We have to go back out and sell ourselves” as guarantors of worldwide stability. Clinton’s opponent for the Democratic presidential nomination, Bernie Sanders, gave Obama strong and immediate support in his posting in the Huffington Post, called, “No More War”. His post had appeared September 12. 2013 (updated November 13), less than a month after Obama’s peaceful “stand down”. Obama’s (and Kerry’s) subsequent negotiations to relieve Syria of its chemical weapons, reached a successful conclusion in June, 2014. At a time of great political division in our country President Obama has found a remarkable way to unite Americans of all political persuasions — conservatives, progressives and moderates. With a loud and clear voice, the overwhelming majority of the American people, across the political spectrum, are saying NO to another war in the Middle East — Syria’s bloody and complicated civil war. Bernie Sanders enjoyed an election sweep Saturday in Democratic caucuses: Washington (72-27), Alaska (82-18) and Hawaii (71-29). Earlier, Sanders won Tuesday caucuses in Utah (80-29) and Idaho (76-21). Before the caucus vote, Washington state’s governor, and all of its Democratic members of Congress, handed over their non-binding super delegate votes to Clinton. It may be time for those political leaders to take some long walks with trusted aides. 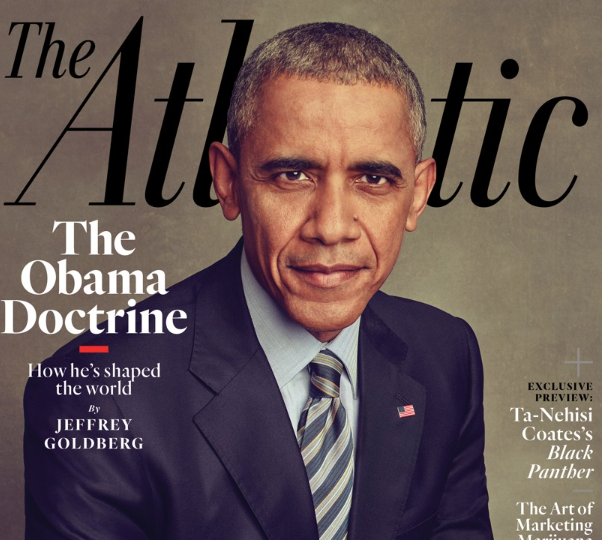 The picture from the cover of The Atlantic magazine is a screen shot. 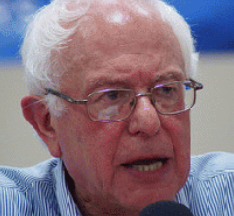 The picture of Bernie Sanders is from flick.com (image by marcn) DMCA. This entry was posted in Hillary Clinton, John Kerry, Middle East, Obama. Bookmark the permalink. The claim that Bashir al Assad gassed his own people near Damascus was a neo-con lie, nicely exposed by Seymour Hersch who showed that the rebels we supported used the chemical weapons. Our President is not a man of peace, but a man compromised as part of the price he had to pay for living in the White House. He was compromised by the same people as compromised John McCain, Mitt Romney, both Bushes, John Kerry, and Bill Clinton, — and they have also compromised Hillary Clinton. We were saved from getting into Syria by none other than Vlaidimir Putin. Go back and read his open letter to the American people in the New York Times, and you will see how right he was, — and still is. He so outplayed Barrack Obama that Obama could not attack Assad without defying Congress which would not authorize a strike, as required by the Constitution. Obama backed down, because the American people agreed with Putin. We should support both Putin and Assad. Our failure to support them has produced the ISIS and ISIL. We should have normal diplomatic relations with Israel and with Iran, trusting neither as an eternal friend, despising neither as an eternal enemy. We need a George Washington-style foreign policy in the Middle East, based on friendly neutrality between Arabs and Jews, and the enlightened national interests of the United States our only goal. The world will forgive us for that, but they will not forgive us for treating Israel as the 51st State. I will forgive the Democrats if they run Bernie Sanders. His ideas are at little lefty-trendy, but he is honest and clean. I will not forgive them if they run Hillary who can escape an indictment only from corruption in the FBI or the DOJ or the White House. Bravo, Jim. You understand President Obama. You understand Secretary Kerry, too. 1. The US, acting for the benefit of Israel and complex interests, had planned the destruction of Syria, the only true secular Arab state with a leader who has the support of the majority of Syrians, long before Obama occupied the Oval Office. 2. The infamous red line drawn by the administration about the use of gas by the Syrian government against its people was a transparent ploy telling the proxies fighting the Assad regime to provide a casus belli for intervention. 3. It has recently been established beyond the shadow of doubt that the gas attack was arranged by Assad’s enemies in the region. The Russian intervention that led to the disposal of Syria’s stock of chemical weapons was a brilliant tactical face-saving move which the US could not dismiss offhand. 4. The failure of the British government to win parliamentary majority for attacking Syria was due to party politics where the then leader of the opposition (who has relatives living in an illegal settlements in Palestine!!!) wanted to score one over the prime minister. However, no sooner than the government’s motion was defeated, the opposition tabled an almost identical motion, but with minor negligible changes. The irate government benches could not stomach the hypocrisy and retaliated in kind, much to the annoyance of the Zionist controlled media. In a nutshell, the majority of British MPs were in favour bombing Syria, but party politics were the spoiler! 4. The US did launch two cruise missiles towards Syria to mark the start of hostilities, but the Russian killjoys intercepted them. 5. Lastly, the US government has not given up its scheming to bring down the legitimate government of Syria and is still exploring possible alternatives. Two days ago, the LA Times published an article, the headline of which reads: “In Syria, militias armed by the Pentagon fight those armed by the CIA”. The LA Times does not, and will not, of course, use the more accurate descriptive term “terrorists” to depict these thugs. is winning by landslides of 80% is despicable. attacked his opponents without American explicit permission. off Assad’s opponents we armed, u will then finish off ISIS. with no regard for collateral damage. Kuwait and Babrain that are 100 times more corrupt. the 5 billion dollar cell phone business without allowing competition. Brilliant article, Jim. The Neo-Cons, including the Israeli formulators of US foreign policy had dictated a US war to destroy Iraq, Syria, Iran, and others on the “List” of countries that can potentially stop Nazi-like Israeli expansion and hegemony in the Middle East. Obviously, Israel first camouflages the directives as ones that concern US interests, for consumption by “mainstream” America, thereby generating hatred for our country. Cheney, Bush, Wolfowitz, Feith, and others, had already targeted Iraq for destruction well before 9/11. Everything else was “spin” to incite civil wars and to lay the groundwork for military US intervention. President Obama was able to prevent such manipulations, at least so far. Hillary Clinton will carry on the Israeli plan, while Sanders will try hard to reduce it to the minimum. However, Israel will still continue with its plan to destroy and break up the remaining Arab countries in the region, through seemingly “self-incited” civil wars. And the story is only in its beginning…..